With a wide variety that will delight even the fussiest of eaters, Anaheim boasts extensive dining options and many top restaurants. There is everything available in Anaheim, from high-end steak houses, pizzerias galore, swanky bistros and elegant hotel restaurants at the theme parks. 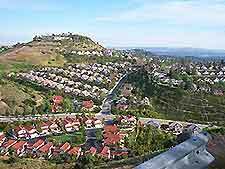 Anaheim also features an excellent choice of international cuisines and dining opportunities, including Chinese, Cuban, French, Italian, Japanese, Scandinavian and Thai restaurants, among other continental and ethnic choices. The choice of eateries at Anaheim's major parks and Downtown Disney are staggering. Anaheim has the usual collection of 24-hour highway diners serving all-day breakfasts, while downtown sidewalk cafés and burger joints usually open at around 07:00 and generally stay open throughout the day. 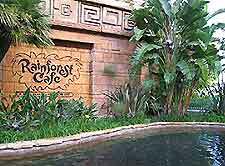 Lunchtime dining venues in Anaheim may open from 11:00 to 14:00, while evening dining establishments typically open at 16:30 or 17:00 and stay open until 21:00 during the week and 22:00 to 23:00 on weekends. The opening hours of restaurants in Anaheim's shopping malls are generally consistent with mall opening hours. Likewise, fast-food chains and the theme park restaurants in Anaheim never close during the park's operating hours. 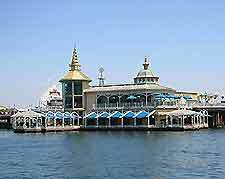 Old Towne Orange, Downtown Disney, Fullerton and Santa Ana are the best places in and around Anaheim if you are looking for a good selection of wine and beer. Each of these districts has a choice of sophisticated venues and restaurants serving wine and beer, while Old Towne Orange offers a favorable ambiance, surrounded as it is by history and historical buildings. 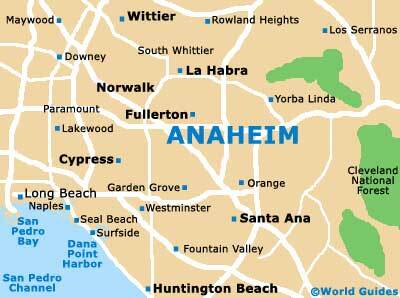 Most people who come to Anaheim will be getting up early ready for a trip to one of the many theme parks in the region. Therefore, many people choose to eat breakfast at their hotel's restaurant. Alternatively, there are plenty of cafés, delis, grills and diners in downtown Anaheim which open at about 06:00 or 07:00 to feed hungry business folk and eager tourists. Lunchtime will usually be spent at one of the theme parks, on-site restaurants or at Downtown Disney, which all offer regular fast-food joints and more. If you are anywhere near Knott's Berry Farm you should try the famous original fried chicken dinner, the brainchild of Knotts. This hearty meal comes with soup, salad, buttermilk biscuits, mashed potatoes and gravy, topped off with a slice of famous boysenberry pie. Other dining options here are just as wholesome. Anaheim's nearby Asian Garden Mall and Fashion Island shopping malls also have a plethora of eating choices suitable for lunch and dinner. The bulk of theme park revelers tend to dine at Downtown Disney or the park's restaurants, as the convenience outweighs the expense. Meanwhile, park hotel restaurants also see a lot of evening diners, who, after a day spent frolicking with Mickey and friends, together with the miles and miles of trudging, are often too tired and hungry to venture into the city. Not far from Anaheim's Disneyland, Little Saigon is a wonderful, atmospheric and inexpensive alternative to hotel dining.